Not every hot spring is as dramatic or as colorful as those in Yellowstone National Park. Many hot springs are rather unassuming pools that seep from hillsides like the one at the right used for soaking by customers of a hot springs resort. 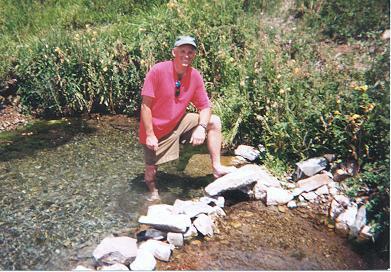 These hot springs are part of a group that emerge from the Mississippian Leadville Limestone in southern Colorado. Water rises along a thrust fault that bounds the western Sangre de Cristo mountains and diverts laterally and upwards through the limestone to emerge as hillside springs. The San Luis valley, a down-dropped fault bounded block is to the west and the San Juan mountains are in the distance. Nearby is a large abandoned mine where iron was produced from hot spring altered iron-rich paleokarst deposits. 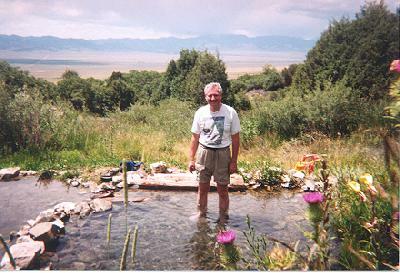 GEOLOGY: See the next section for more on the geology of hot springs.